I ran my first marathon in New York City. It was an amazing experience that I’ll always remember and cherish. I was so excited to have finished a marathon and to have done it in New York! 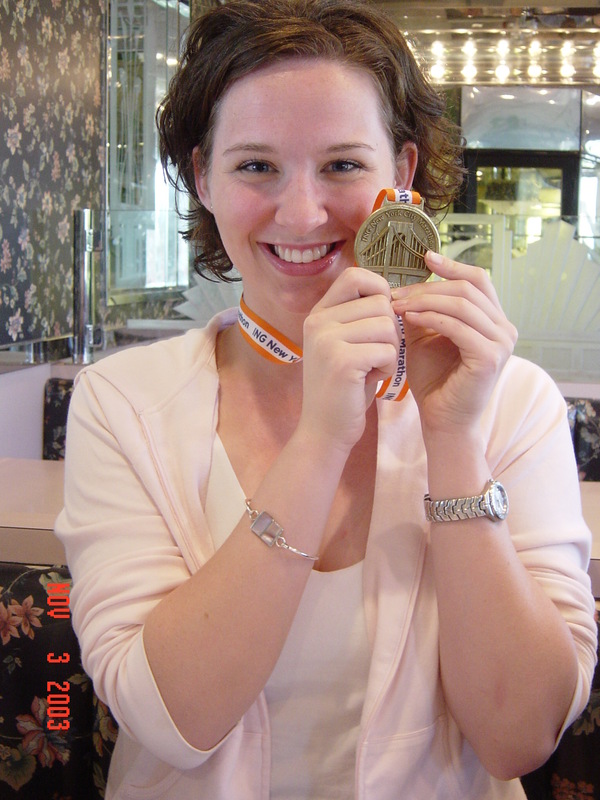 Me and my very first marathon medal the next morning. Yay! But I also remember being seriously bummed out as the post-marathon high wore off. What the heck? Wasn’t I supposed to be walking on airs for at least a few weeks, basking in the glow of the finish line glory for all the world to see? Well, yes, buuuuuuut, that died down after about a week. People stopped asking about it and life, you know, moved on. My high was gone and I was still in marathon recovery mode, so I couldn’t exactly just pick up and race again. So sad. I had reached my goal! Now what? I eventually came out of my funk but it took a whole new experience to get me going again. 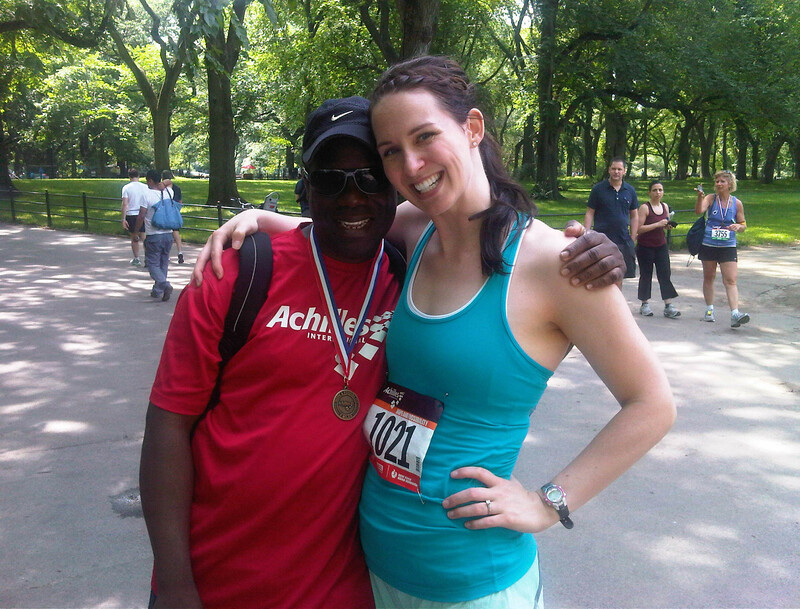 That’s when I found Achilles International and started volunteering on Saturday mornings as a guide for disabled runners in Central Park. Running with these amazing athletes definitely helped me get my groove back and even gave me a goal for the next marathon season. Me and my friend, Leol, who also finished the NYCM this year! Do something else. Anything else. Maybe even do something besides running (gasp!) or do something running-related, like volunteering at a local race with kids or something cute like that. The Girls On the Run 5K is on December 10th, which I’m going to use as my post-marathon, holiday season, do-gooder, get-off-my-post-marathon-a** and do something new event. But what gets YOU going after a marathon? A new challenge: triathlon, 30 day yoga challenge anyone? A new activity: indoor cycling/climbing/kickboxing? Something completely different: book club/rearrange your apartment furniture/clean out all your closets/volunteer at a homeless kitchen…what else? Or maybe you caught the marathon bug and are already searching for your next race and a new training schedule to have an even better finish time. That’s what I’ve done after the past few marathons. I got to a place where my marathons didn’t leave me as spent as they did in the beginning (don’t get me wrong, I was TIRED and I worked HARD, but I recovered faster) so I decided to switch up my training schedule to accommodate two marathons a year instead of one. The result was Jersey. Which…well, it wasn’t a success where time was concerned BUT it was a HUGE success where my training was concerned. I finished super-strong and on pace despite having a hideous middle eight miles. To me, that was the biggest success of my running career. Yay! Proudest finisher at the NJ Marathon! So, if you’re finding yourself down in the dumps post-marathon (or any other race/goal), set a new goal. Don’t have one? Sit down with a friend who motivates and encourages you and get the conversation going in the direction of a new goal. I cannot stress enough to you how very real this problem can be. You’ve achieved a goal that many people never even consider attempting and that can be a very difficult high to come down from. This is the best way I have learned how to deal with the post-marathon blues. What are your tricks? Tell me all about it and then go out and run! Yay for yoga! Weight training (especially for glutes & hips) helps tremendously with IT band issues.